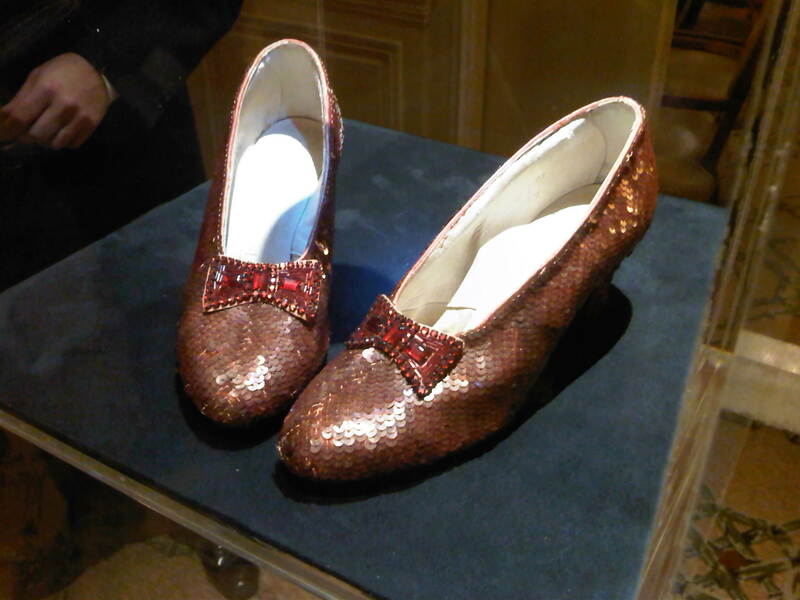 There is magic in the faded sequins and the scribbled wardrobe notes and the red painted soles. And on this day, alerted via press release shared by one of my colleague theatre bloggers, I have presented myself as a fan of old Hollywood, of Judy Garland, and of M-G-M and other studio products of the Studio Age of motion pictures at a special event providing a once in a lifetime viewing of one of several known production pairs of “ruby slippers” worn by Judy Garland as Dorothy Gale in M-G-M’s 1939 classic The Wizard of Oz. The star this day is not the tea cakes nor the fellow guests nor the lovely room nor the sweet musicians nor the rosy-hued bubbly. 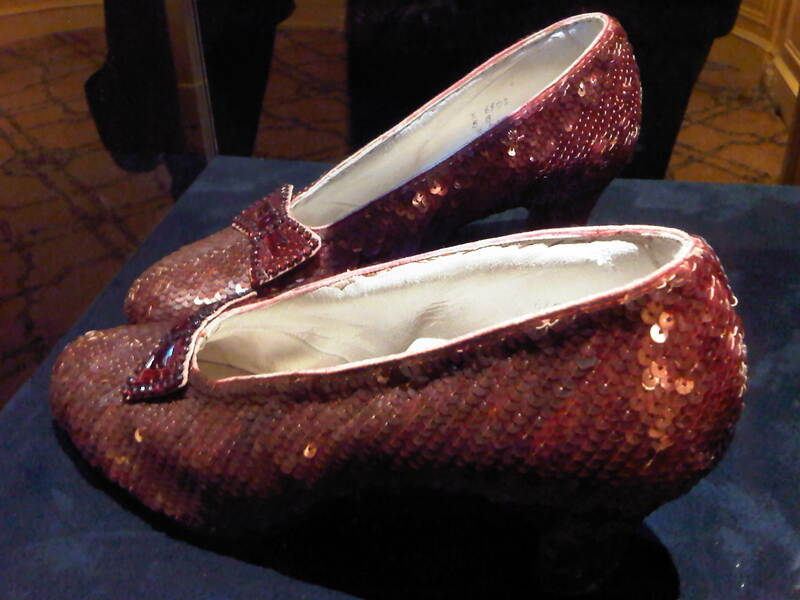 Throughout the adventure, small groups of tea guests wander into a heavily guarded side room to have their moments with the ruby slippers themselves, our guest of honor. Parents with children take pictures of their young ones standing beside the encased mementoes. 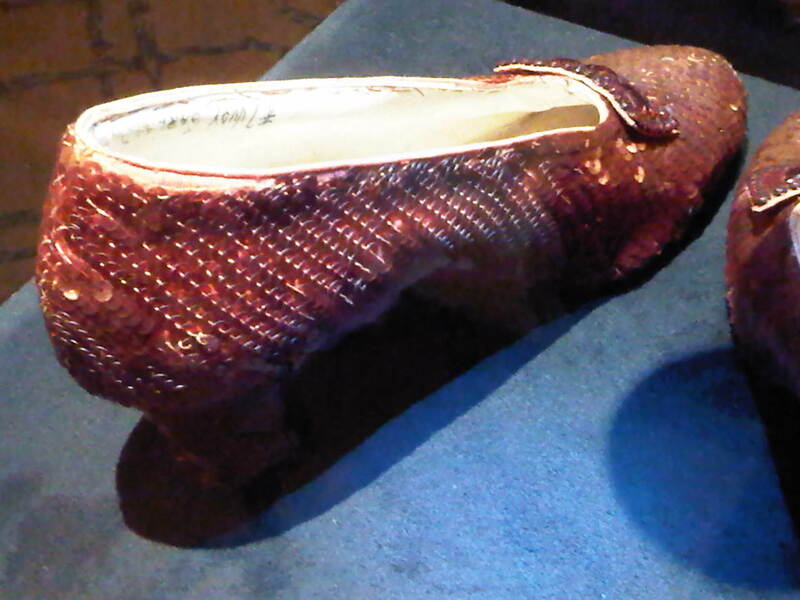 Some (like myself, in my pre-tea chat with the press agent and the Profiles in History representative) chat more specifically about the shoes, their use in the movie, their relationship to the other known pairs of shoes used during the production (including one of a discarded Arabian design, several with felt soles for dancing, at least one of a size larger than Garland’s size 5B for her stand in). And all of us simply drink in the aura. It is certain that these are shoes that are over 70 years old, worn by time, faded by air and light. The specialness in not in their appearance now (as is true for most movie memorabilia) but for what they represent. There is some palpable magic to them as you stand there — and those who have visited the pair that lives at the National Museum of American History in Washington, DC have felt this sensation. You know that you are standing near Hollywood history. If you attend to the atmosphere around you, in addition, you realize it is a cultural and world history too. You can hear in the conversations, the chatter that I experienced many times during the years I lived in DC, how we all react to these symbols. Little kids and older people and folks who do not speak English much at all just glow with their own memories of what this movie means to them. While most of us are just visitors to the magic, there IS magic in them there slippers that someone will pay a great deal to own. 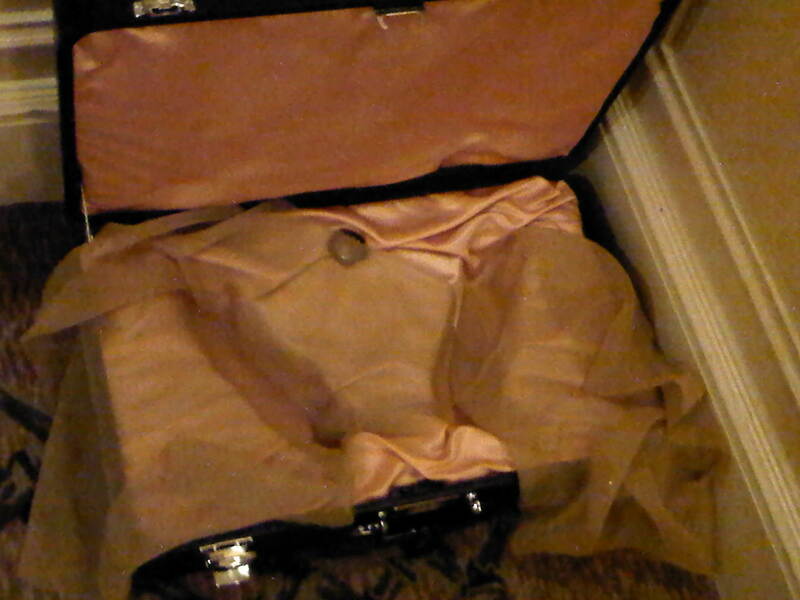 And after the viewing, the slippers were to be packed into their special case and shipped across country for the auction event to be held on December 16, 2011. Somehow this box holds as much mystery for me as the shoes themselves. Perhaps it is the sense of promise, the sense of possibility, and yes, of the magic they represent. updates as of 22 February 2012: Leonardo DiCaprio and others purchased the Slippers for the collection of the Academy of Motion Picture Arts and Sciences. Bravo people, bravo.